This hearty salad can serve as a satisfying light main course on its own – or it can be paired with another low-carb entree, such as the Garlic-Herb Roasted Chicken and some streamed broccoli for a more well-rounded meal. 1. To make the blue cheese dressing, combine the avocado mayonnaise, blue cheese, Greek yogurt, sour cream, and garlic salt in a medium glass or other non-reactive bowl. Stir enough half & half into the blue cheese mixture to reach the desired consistency. Season with salt and black pepper, to taste, and stir to combine. Cover and refrigerate until ready to use. 2. When ready to serve, place each wedge of iceberg lettuce onto individual chilled serving plates. 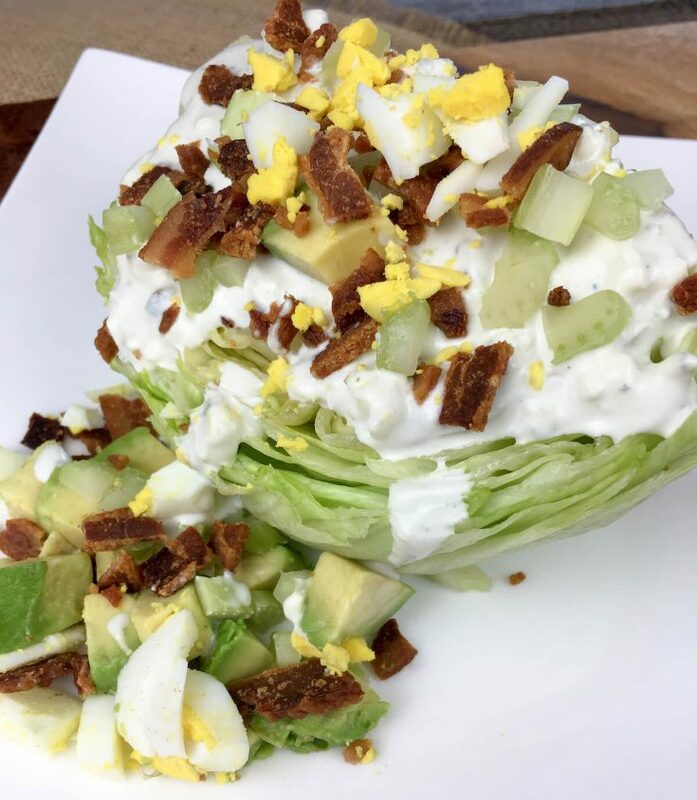 Drizzle each wedge with some homemade blue cheese dressing, and then top each with an equal amount of avocado, crumbled bacon, chopped hard-boiled eggs, and chopped celery. Season with salt and black pepper, to taste, and serve immediately.